There is something indescribably awesome about wearing a world-timer. 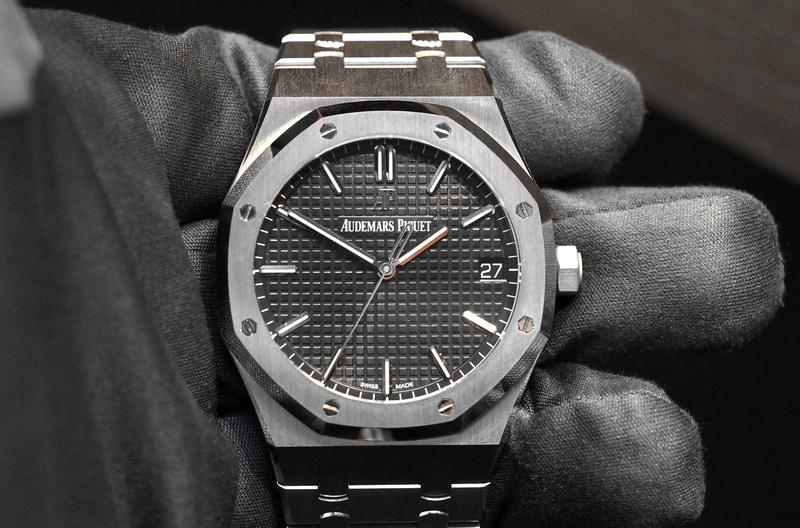 It may have something to do with the increased functionality of a mechanical timepiece that does much more than just keep the local time (instead of just relying on a smartphone). It may have something to do with the added complexities of the mechanical movement, the design layout of its dial, or the extra crown which operates the internally rotating bezel to cycle through time zones. But for me, I think the awesomeness has more to do with the lifestyle wearing one suggests. 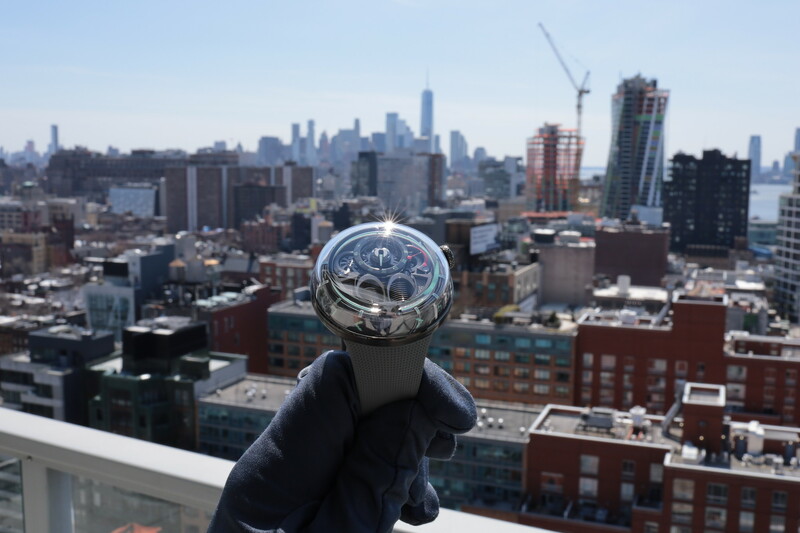 It is cool to think of oneself as a man of the world – and having a wristwatch that keeps you apprised of international city times with a quick glance of the wrist gives the feeling that you’ve “made it,” and you know what’s up — everywhere. But the problem with many world timing wristwatches that I’ve handled is that out of necessity, the dials are overly complex – and in most cases so complex that they become difficult to read. And as great as it is to have all of the added functionality of a world-timer included in your timepiece if you can’t manage to read the simple time, it’s not much good at all. 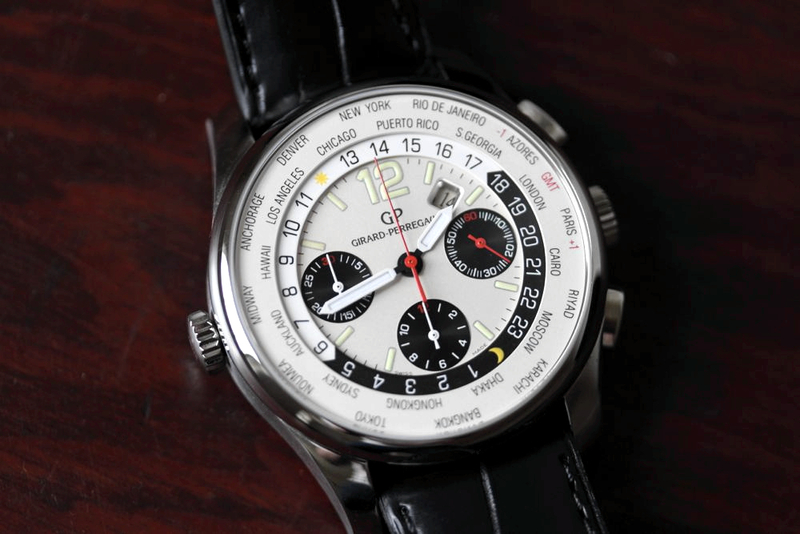 What’s so impressive about the Girard-Perregaux ww.tc (World Wide Time Control) model I recently checked out is that GP has managed to create an impressive worldtimer with an in-house movement that has a stunning and easily readable dial – and even added a chronograph function. The ww.tc Chronograph is not a new piece by any means, and there are over 30 variations in GP’s current lineup, including a Financial version designed specifically for traders watching the international markets, and the all black Dark Night version we covered HERE. For the purposes of this review, we spent some time with the most basic model of the chronograph line, finished in a brushed steel case with a polished bezel and fitted with a black crocodile strap with deployment buckle. Starting with the basics, this model features a 43mm case, inside of which beats the GP033 in-house movement. With 63 jewels, a 46-hour power reserve, and a frequency of 28,800 vibrations an hour, this is a robust caliber that has been put to good use across GP’s line. Naturally, we are drawn to anything with a proper in-house mechanical movement nowadays, and although the ww.tc is getting a bit long in the tooth in regards to its production run, it remains a winner across the board. There is no question in my mind that the brand is ahead of the curve on utilizing in-house movements and enthusiasts should take note. Stylistically speaking, the ww.tc Chronograph benefits from a simple and easy to decipher layout – a silvery white dial with black sub dials and green luminescent hour markings with an Arabic numeral at the 12 o’clock position. The subsidiary seconds function at 3 o’clock and the chrome sweep hand add a dash of red to brighten up the dial. The 30 minute and 12-hour counters both have white hands. The hour and minute hands are white and luminescent. A non-magnified date function resides between 1 and 2, and although small, is easily readable and doesn’t get lost on the dial. The crystals protecting the dial and on the display back are sapphire. Surrounding the main dial is a rotating 24 hour day/night ring which is operated by the right crown when the time is set. 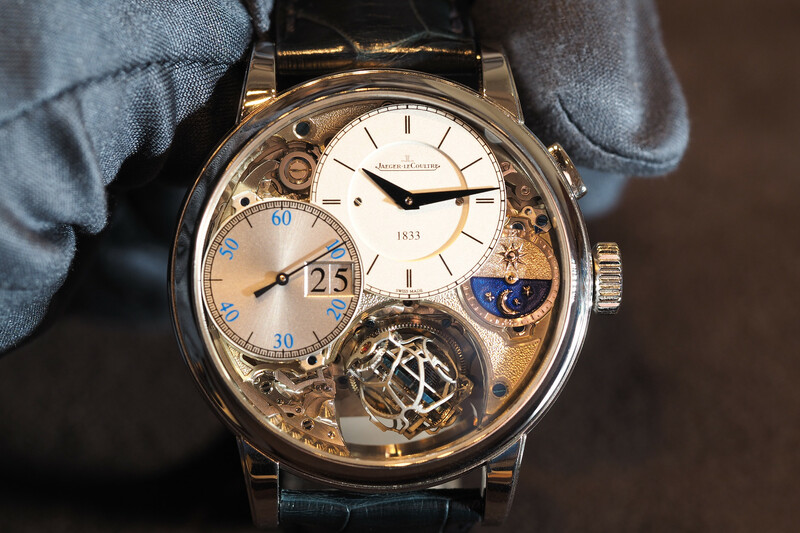 The outermost ring features 24 city time zones and is operated by the crown on the left side of the case. Both crowns screw down and give the case water resistant to 3 atmospheres (100 feet), should you prefer to check the time in Karachi while Scuba Diving in Hawaii. Overall, the case design is classically designed and proportioned, and despite being almost 13.5mm thick, it wears very nicely with shirt cuffs. The chrono pushers are the only outwardly modern feature on the case, designed with a squared-off teardrop shape. The only design cue that seemed out of place on the piece is the matte-gray aluminum deployment buckle, which honestly looks a bit out of place with the rest of the brightwork. While it admittedly takes a little practice to learn how to properly read any worldtimer, the ww.tc Chronograph makes it easy, and in no time I found myself using it to check the time world-over several times daily. With great looks, an incredibly well executed dial, a chronograph function, and an in-house movement, the Girard-Perregaux is a bargain in steel at $15,900. For those who prefer different materials or dial layouts, there are plenty to choose from – including Titanium, Pink & White Gold, and Ceramic.